Mormonism has always held to the position that the Bible we have today has been corrupted. In 1st Nephi 13 the Book of Mormon talks about the “many plain and precious things taken away from the book”; that is, the book identified in the Book of Mormon Gospel Doctrine Teacher’s Manual as the Bible (see page 18). 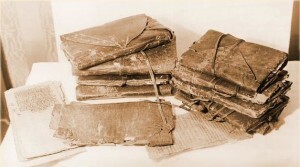 When the Mormon teaching of a corrupted and incomplete Bible is combined with the general LDS vilification of Constantine and the Council of Nicaea, what results is a criticism often heard promoted by members of the Mormon Church – that Constantine and/or the early church Councils decided which books they wanted in the Bible, and which they didn’t, and formed the canon accordingly. “Kurt Eichenwald, in his ridiculous hit piece on the Bible in last month’s Newsweek, repeats the claim that Constantine ‘ultimately influenced’ which books made it into the New Testament. “There are lots of problems with this mythical telling of church history, not the least of which is that the Council of Nicaea never even addressed the question of what books ‘belong’ in the New Testament, much less dictated it. Oops. Dr. Mattson lays out his case for a long-settled canon being in place well before Constantine came on the scene, based on Constantine’s interaction with early church historian Eusebius. This entry was posted in Bible, Early Christianity, Misconceptions and tagged Bible, biblical reliability, Canon, Council of Nicea, LDS Church, Mormon Church, Mormonism, Mormons. Bookmark the permalink. So what Mormons had to do and still do, is create a narrative that would fit Joseph Smith’s claim that the creeds of all the various Christian denominations were an abomination. Then in an effort to create his own religion, in his own image and likeness, he said that he had a “restored” gospel. This restored gospel was suppose to reflect what the Church Jesus established believed, taught and practiced prior to the death of the apostles. It went lost. I guess it all came to Smith via revelation because there is no proof that Mormonism generally and the LDS sect in particular practice what the first century Church practiced. Mormonism is a 19th century creation that has changed often. Talk about “plain and precious truths” being lost. There’s a reason there are so many different Mormon sects. If Mormons want Nauvoo/Utah style Mormonism they can join the FLDS. If they want Mormonism at its inception try the Community of Christ or Temple Lot sects. If they want a hybrid form of Mormonism there’s the LDS. But if they want authentic first century Christianity, leave Mormonism, get yourselves born again by the Spirit of God through faith in Jesus Christ and drop the false premises upon which Mormonism is built. Here’s the thing about history. There are facts and there is how people “interpret” those facts; that is attach meaning to them. Mormons get it wrong on both counts. They play fast and loose with the facts and they attach “meaning” that is self-serving. It’s not all that unusual actually. Groups often see the facts of history through their own lens. It’s like that with people who sign-on to a political candidate. They listen to what the candidate says and then fill it up with their own meaning. But with Mormonism’s historical claims, it’s easy to get the facts. They choose not to. Mormonism creates its own facts and then adds meaning to those facts to support what they want to believe. Exhibit one: Did the gospel of Jesus Christ disappear after the death of the apostles? That’s easy to find the facts. No meaning needs to be attached to it. Exhibit two: Was the Biblical text corrupted? That is also very easy to find out. Now as to what the Biblical text means is a whole other story. That’s where the attaching meaning comes. Problem for Mormons is that they can torture the Scriptures to make it say what they want but they can’t pull it off. Finally, can it be proven that the BoM, a supposed additional witness of Jesus Christ be proven to be historically false. That too is easy. In fact the Community of Christ Mormon sect gives their members the option of seeing the BoM as a “spiritual” book. That is, it isn’t historical in nature. It seems to me that that sect has figured it out and have moved on. Moving on is something that LDS members are doing everyday as more and more are leaving the sect. Certainly not the Bible, as they like to remind everyone. Not even Joseph Smith’s “inspired version” of the Bible because it was never finished. Not the Pearl of Great Price with the Book of Abraham because the Church has recently recanted, admitting this scripture has been totally misrepresented as a translation of Egyptian papyri. Not the Doctrine and Covenants, because the Church has deleted many important sections from it and its predecessor. When you get right down to it, the only complete scripture the LDS have is whatever their prophet says today, which can easily contradict what he and his predecessors said yesterday. I think the reason Mormon leaders have said some of the things they have against the Bible is simply because that afforded them a convenient way to go ahead and introduce their strange doctrines . It is very difficult for Mormon leaders to use the Bible to prove some of the teachings Joseph Smith , Brigham Young and others preached , so either they must deny , or downplay some of these teachings ( in public ) or they resort to saying the scriptures really did contain them but corrupt men took them out long , long ago etc . The answer to this supposed corrupted Bible then is to have the latter days prophets of Mormonism fix it . But that has’nt happened . LDS are just told the Bible belongs on the “dead prophets” shelf ( along with the Book of Mormon) and to go with whatever the “living prophet” teaches . Who cares if what he teaches is not in accord with what his dead colleagues taught . It does’nt matter , stay in line ! Sorry , but I’m sticking with the Bible . God has preserved the true gospel of salvation ( Rom 1:16 ; 1Cor 15:1-4 ; Col 1:20-23 ) down through the years so that we today can know who He is , what His Son did on the cross for sinners , and how to receive eternal life . Enough is in there — Jn 20:30-31. Thankfully, so is information about the danger of latter days false prophets who will arise and deceive many people . It goes without saying that these prophets have to convince people to accept their new revelations/ teachings , and what better way to fool people than to claim the Bible is deficient to deliver enough truth to save sinners . We could fill a large storage unit with what the LDS people don’t know. And what they really don’t know is anything regarding the historicity of the Bible and the textual criticism it has undergone over the centuries. If the LDS want to check out the “lost books” of the Bible, they could pick up a copy of the Catholic Bible including the apocrypha. The New Testament canon of the Catholic Bible and the Protestant Bible are the same with 27 Books. The difference in the Old Testaments actually goes back to the time before and during Christ’s life. At this time, there was no official Jewish canon of scripture. The Jews in Egypt translated their choices of the Hebrew Scriptures into Greek in the second century before Christ. This translation of 46 books, called the Septuagint, had wide use in the Roman world because most Jews lived far from Palestine in Greek cities. Many of these Jews spoke only Greek. The early Christian Church was born into this world. The Church, with its bilingual Jews and more and more Greek-speaking Gentiles, used the books of the Septuagint as its Bible. Remember the early Christians were just writing the documents what would become the New Testament. After the destruction of the Temple in Jerusalem, with increasing persecution from the Romans and competition from the fledgling Christian Church, the Jewish leaders came together and declared its official canon of Scripture, eliminating seven books from the Septuagint. The books removed were Tobit, Judith, 1 Maccabees, 2 Maccabees, Wisdom (of Solomon), Sirach, and Baruch. Parts of existing books were also removed including Psalm 151 (from Psalms), parts of the Book of Esther, Susanna (from Daniel as chapter 13), and Bel and the Dragon (from Daniel as chapter 14). The Christian Church filled with the Holy Spirit did not follow suit but kept all the books in the Septuagint. 46 + 27 = 73 Books total. 1500 years later, Protestants decided to keep the Catholic New Testament but change its Old Testament from the Catholic canon to the Jewish canon. ” Members of The Church of Jesus Christ of Latter-day saints ( known informally by the nickname Mormons ) believe the Bible . Indeed , so literally and completely do their beliefs and practices conform to the teachings of the Bible that it is not uncommon to here informed persons say: ‘ If all men believed the Bible , all would be Mormons ‘ . Bible doctrine is Mormon doctrine , and Mormon doctrine is Bible doctrine . They are one and the same .” [ What The Mormons Think of Christ , by apostle Bruce McConkie , p 2 ; cited in Mormons Claims Answered by Marvin Cowan , p 23 ] . Taken at face value that quote is truly amazing , It’s classic Mormon P.R. What exactly is the scam here? To be fair, I don’t think that this LDS, like most LDS have any clue what they are saying. They learn these little ditties down at the ward and just keep repeating them. It’s meaningless gibberish. It’s the pablum they are fed and eat with great relish (humor alert). I must admit it just irritates me the way the LDS simply accept what they are told and don’t bother to question it. They’ve been scared into staying away from any serious inquiry or they are just plain lazy. But to be fair, sort of, Lee Baker and Earl Erskine, both former LDS bishops say a couple of things by way of explanation. One is that they didn’t know what questions to ask. They didn’t know what they didn’t know. The other is that the information was hidden in plain sight right in Mormon historical literature. When we would have these discussions in the old days and Mormons would comment, they most often would quote information either from atheists or the most liberal Bible “scholars” they could find. It is true. People are known by the company they keep. The problem with this approach is two-fold: First, it encourages willful ignorance about the Bible, and blind obedience to LDS leaders. Second, the Church has underestimated the effect the limited and highly biased facts in its Gospel Topics essays will have. Any reasonable Mormon reading some of these essays will have immediate questions concerning the truthfulness of the Church and its views on Bible teachings. The Church’s usual response: Stay away from the Internet and re-read the Book of Mormon. (LDS leaders rarely recommend that Church members read the Bible…) Most Mormons will blindly obey this counsel from their leaders for any number of reasons, most of them bad. The big question, of course, is “Will Mormons seek sound information about the Bible truths?” Only the individual Mormon can answer that question. To be charitable, let us just say that the LDS are “comfortable” in their religion. If Mormons read the Bible, particularly the New Testament, they will know the truth. These sects are absolutely paranoid about losing members. Their paranoia is well founded because factual information is the enemy of high control groups. They need to control the information flow to members. The LDS leaders know they are losing members at an alarming rate. It’s not just the members who haven’t been “Mormonized” that are going inactive. Those folks really don’t care. They just aren’t into the LDS program. The former members who are a problem for the LDS sect are those who are angry and won’t go quietly. Even after their anger subsides, they won’t shut-up. The problem is they come ready armed with facts and evidence to debunk Mormonism. Get a Mormon to read the Bible and recognize God’s revelation. Mormonism just isn’t to be found there. And it looks like the Church is doubling down on protecting its steadfast members from the truth. Like you said, getting more paranoid. In the process, they seem to be throwing doubters and educated LDS under the bus as they throw up the barricades to prevent the more contented members from roaming the Internet or asking questions. Kind of a last-ditch effort to save a select few. One LDS blogger even suggested that the LDS church curtail their missionary outreach and work to Mormonize those already in the sect. I would be willing to bet that the retention rates among converts is incredibly low. For those who do stick around, I’m betting that the number who become full-on temple Mormons is not a real high number. Let’s face it. LDS sect style Mormonism is very demanding. The sect would have to work over-time to come up with strategies to retain members. Maybe good programs and high moral standards might be helpful, but the time and financial demands/commitment is more than most people would care to do. The LDS church demands absolute obedience and buy-in. As a Christian my commitment is not to some religious organization, it’s to Jesus Christ. Having come to Him in faith and being born again by the Spirit of God, my goal is to be a living sacrifice in gratitude to God. This isn’t done by jumping through religious hoops. So what happens when an LDS swerves into information that contradicts the whole premise for the establishment of Mormonism? This could be a real problem unless, of course, they can come up with some sort of explanation to reject the evidence. The premise for the establishment of Mormonism was that after the death of the apostles, the gospel was lost and needed to be restored. The twin to this premise is that the Bible text has been corrupted and can’t be trusted. If you get an LDS to go to the next level of questioning, they’re pretty much lost. They may mumble something about the Biblical text being corrupted because of all of the copying. They might even have been taught that at the Council of Nicea in the early third century, the Emperor made up a “creed”. This creed and any others are said to be an abomination in the sight of God. If you can get the LDS to stay with you in discussion, there will come a point where they paint themselves into a corner, bear their testimony and run away. Discussions that are effective in dismantling the premises for the establishment of Mormonism, make them feel bad and doubt. They attribute this to Satan, and here is where the LDS church has set-up it’s protective wall around the member to keep them in the sect. Think about it. If the premise upon which Mormonism is built is not true, then the “church” is not true. If the “church” is not true, how does a dedicated member, whose hopes, dreams and aspirations are tied-up in the organization, emotionally cope with this? Some members discover the Mormon “shelf”. That’s the place where all the things that don’t make sense are placed. If there aren’t many things on the shelf, the shelf is secure and just collects dust. However if too many things accumulate on the shelf there comes a point where it all collapses. Cleaning up the mess becomes painful. Thankfully there is an answer. Coming to faith in Jesus Christ and establishing a relationship with him will be more profound and satisfying than any faux religious experience Mormonism can provide. I think you’ve correctly identified the problem, the process, and the solution. Nice succinct job there. ” …. the records shall be preserved , He was abundantly able to preserve them by His power and fulfill His promise .” [ J.of D . vol 18, p 348 ] . That is what God did with His prophets / apostles teachings in the Bible — not all that was written down by them was supposed to be in our Bible today . However what we do have there is sufficient to accomplish God’s will . What is His will ? Primarily , it is that people know who He is — Isa 43:10 ; and who the Savior is — Jn 8:58 ; 17: 3 , so that they can be reconciled to Him , be completely forgiven , and receive eternal life — 1Pt 2:4 . In short , the gospel of salvation .The Bible contains that . The same gospel of salvation that Paul ( for example ) preached , people accepted , were forgiven by God and were saved –Col 1:20-23 ; Rom 1:16 , and that same message has been preserved down through the centuries and is available today in the Bible . So anyone who accepts what Paul taught gains the same benefits as those of long ago did — Acts 2:22-47 ; Rom 10:9-13 ; Eph 2:8-9 . I’ve never been able to figure out how the LDS can claim that the gospel was lost and the Bible is corrupt. Here’s the Gospel of Jesus Christ. Mankind is separated from God by sin. In order to enter God’s presence, a person has to be perfect as God is perfect. It is impossible for a person to be sinless thus a gap exists between God’s standard and our behavior. We are lost. God in his love, mercy, benevolence and kindness provided a perfect sacrifice for sin. The sacrifice was the shed blood of Jesus the Messiah. In order to appropriate the free gift of salvation that God is offering, we accept this sacrifice through faith. The Blood of Christ covers us and God sees us as spotless, without blemish. We are perfect as declared by God. Now it doesn’t appear that anything was lost. The Bible, from beginning to end testifies to what I’ve just presented. We have the total Gospel of Jesus Christ. Nothing can be added to it. As an addendum let me say that our “works” have nothing to do with our salvation. Our works are a result of our faith. We walk in the Spirit now having been freed from the penalty of sin as a result of our faith in the Lord Jesus Christ. I remember posting something like this in the past and a Mormon responded by saying it was too “easy”. I responded by saying that God didn’t mean for it to be complicated. Salvation is a gift. We don’t deserve it and we can’t earn it. That’s the beauty of what God has done for us in Christ. It’s a free gift that doesn’t cost us anything but cost God everything. Anybody out there think that they can add to anything Jesus, who was the perfect sacrifice, did on the cross? The Bible contains the whole of the revelation. Anyone preaching another gospel, says the apostle Paul, is accursed. That’s pretty serious stuff!